Hosting karaoke right in your home makes for an enjoyable evening. 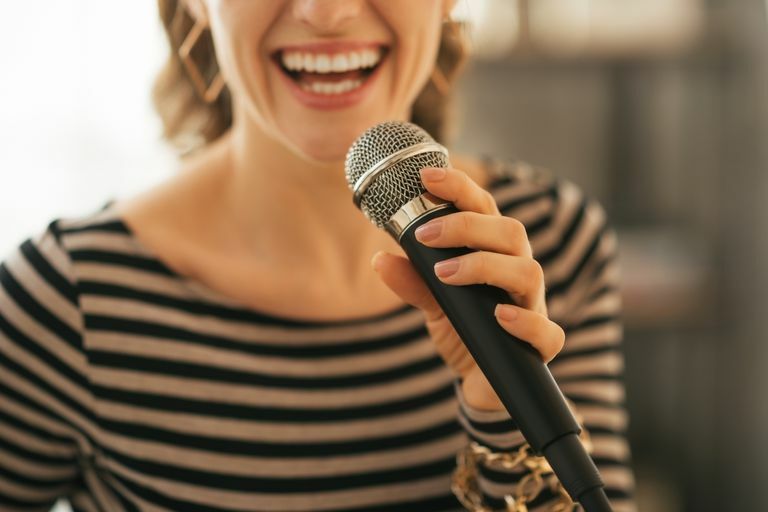 Not only are your guests actively involved in the music entertainment, but the vibe ends up more private compared doing karaoke at a bar or nightclub. Many affordable karaoke machines dot the market. You can find models that have factory-installed song libraries, several microphone inputs, Bluetooth wireless connectivity, built-in speakers, dedicated display for lyrics, separate volume/equalizer controls, song expansion via USB/flash card/mobile devices, auxiliary inputs, AV outputs, internal batteries, colorful light show projections, compatibility with multiple digital audio formats, included microphones, and more. What’s great about many of these karaoke machines is that they’re plug-and-play. Ones that don’t have a built-in display for lyrics simply connect directly to a television or through your home stereo receiver. Most all karaoke machines support the CD+G format, which is essentially a music CD that can display graphics (song lyrics) along with the audio. You can find plenty of these kinds of CDs online (e.g. Amazon), covering the top song hits by decade, artist, or music genre. It’s the easiest way to expand your karaoke song collection! Karaoke subscription services can offer a great value in lieu of a hardware investment. Sites, such as Karafun, Redkaraoke, or KaraokeCloudPlayer let people use computers, laptops, tablets, or smartphones in place of a machine. The cost of a basic (two-day, one-week, or monthly) subscription is often less than one single CD+G purchase and can be canceled at any time. What’s great about karaoke subscription services is instantaneous cloud access to thousands of songs with an easy-to-use interface, saving you from having to shuffle through music CD+Gs or external media storage. Many of these services wirelessly stream music and lyrics to TVs using Apple AirPlay, Google Chromecast, or Amazon Fire TV. Some also support features like offline sync, audio controls, Bluetooth wireless, and second-display support in addition to standard AV input/output, microphone, and speaker connections. While it’s totally possible to sing acoustic karaoke, most will prefer to use a microphone. It isn’t necessary to own a studio-grade microphone for karaoke unless you plan to make this kind of party a regular thing. Wired microphones are the easiest to set up, so long as the cord doesn’t get in the way (e.g. dancing, performances, foot traffic). Otherwise, there are microphones which offer wireless freedom, but they can be expensive as well as take a bit more effort to set up properly. But no matter what, always have at least two microphones available. Duets are far more fun (and less terrifying) than solo performances, even if the song choice wasn’t originally meant for two people. And in the cases when you only feature one singer at a time, the second microphone becomes a handy backup in case anything happens to the first one or if the event requires an emcee. It’s not going to be much of a karaoke party without a decent sound system. Use almost any speakers you have, including the portable wireless kind or a quality stereo pair — the latter is recommended for the best karaoke experience. While some speakers connect directly to a karaoke player or device running a karaoke subscription service, leverage the power of your home stereo receiver to avoid substantial tweaking of the sound output and to enhance the audio through adjustment of its equalizer controls. A sound mixer combines several input sources. Some models offer independent volume levels, while others allow tuning for tone, echo, balance, and frequency bands. These devices — especially the ones meant for karaoke — offer AV output so that both music and video (for displaying lyrics) information passes to the proper equipment. These mixers work with computers, laptops, smartphones, and tablets as well as with karaoke machines and receivers. Do a trial run a day or two before the party. Double check all audio, video, and internet connections (particularly if you’re holding the party further away from your wireless networks such as in the garage or back yard). Sound test your system with the microphones and singing. You may need to make some adjustments to the levels to get it right. Notify your neighbors as a courtesy. Set up a general playlist to keep the party vibe going without interruption. You can always deviate to a different track in the moment. Invite your friends to send special song requests before the party so you don’t have to spend much time searching for them. Consider setting up teams for competitions, complete with judging and point scoring. Have a bunch of costumes, wigs, props, and accessories available for everyone to use.